Environmental migration is not new. Nevertheless, the events and processes accompanying global climate change threaten to increase human movement both within states and across international borders. The Inter-governmental Panel on Climate Change has predicted an increased frequency and severity of climate events such as storms, cyclones and hurricanes, as well as longer-term sea level rise and desertification, which will impact upon people's ability to survive in certain parts of the world. This book brings together a variety of disciplinary perspectives on the phenomenon of climate-induced displacement. With chapters by leading scholars in their field, it collects in one place a rigorous, holistic analysis of the phenomenon, which can better inform academic understanding and policy development alike. Governments have not been prepared to take a leading role in developing responses to the issue, in large part due to the absence of strong theoretical frameworks from which sound policy can be constructed. 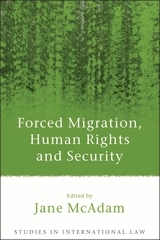 The specialist expertise of the authors in this book means that each chapter identifies key issues that need to be considered in shaping domestic, regional and international responses, including the complex causes of movement, the conceptualisation of migration responses to climate change, the terminology that should be used to describe those who move, and attitudes to migration that may affect decisions to stay or leave. The book will help to facilitate the creation of principled, research-based responses, and establish climate-induced displacement as an important aspect of both the climate change and global migration debates. 9. Climate Migration and Climate Migrants: What Threat, Whose Security? 11. Climate Change, Human Movement and the Promotion of Mental Health: What have we Learnt from Earlier Global Stressors? “...the collection constitutes a concise reader of well-researched concerns and approaches that populate the broader literature. It also makes a novel contribution, in consecutive chapters by McMichael et al. and Loughry, by introducing health as an associated topic of concern to the central focus. The collection ... has value in that it is one of the very few on the topic, and thus constitutes a useful 'one stop shop' for anyone wanting to familiarize themselves with the tendencies of the literature on this increasingly prominent...area. 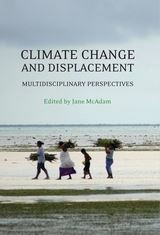 “McAdam succeeds in the long-overdue endeavour to bring together all disciplines relevant to climate-induced displacement that so far have only been analysed and published separately. While reading the compilation of essays, the reader understands the 'full picture' and develops true understanding of the overall topic when he reads about an issue raised in one essay within a specific discipline that he can relate to another issue raised within another discipline… This paves the way for the necessary next step highlighted by McAdam: to interrelate the different perspectives and conduct true interdisciplinary research. The endeavour of compiling multidisciplinary perspectives bears a major challenge: the reader will not necessarily have background knowledge of all disciplines. Therefore, the different essays need to be addressed to an audience of laymen, who neither are familiar with the discipline as such nor have any background knowledge on the particular topic addressed. All authors succeed in this by providing the reader with a clear overview of the relevant aspects, which is remarkable given the complex relationship between climate change and displacement. “The book's multidisciplinary approach to analysing climate-caused displacement provides the reader [with] a broad foundational understanding of the central challenges in this area. McAdam brings together a diverse group of scholars on the subject in order to give the reader a dynamic view and understanding of climate-induced migration. Her approach spans not only the breadth of the topic concerning climate-induced migration but also its depth. ...this book highlights the need for immediate action in this area. By approaching environmentally-induced migration from a multidisciplinary perspective, McAdam has greatly advanced the understanding of the intersection between climate change and displacement. “Jane McAdam's collection of essays with its multidisciplinary approach is a welcome addition to the existing corpus of literature in the area. The contributors are leading experts in the field and their opinions are significant for guiding well-informed policy. Climate Change and Displacement should be read by anyone interested in this area. The book provides a good understanding of existing legal regimes and institutions and their limitations. It considers innovative solutions that could be turned into international responses. “...an ambitious and uniquely comprehensive perspective on climate-induced displacement, incorporating diverse fields such as geography, sociology, law, political economics, moral philosophy, public health, medical anthropology, epidemiology, international relations, and psychology... McAdam's multidisciplinary compilation is a much-needed contribution to the study of climate change adaptation. ...a uniquely rich and comprehensive resource for informing international policy and laws. “...a careful and detailed analysis of some of the major aspects of climate change-related movement. ...an interesting compilation of nuanced views which dissipate many stereotypes as to the nature of climate change displacement and the appropriate response strategies. ...a valuable contribution to the body of literature on climate change-induced migration. While no single book can comprehensively treat this exceedingly complex issue, the volume brings together an array of high-quality contributions which, read on their own, offer in-depth insights into some of its most crucial aspects, and which, taken in their ensemble, provide a solid basis for future interdisciplinary research. “... the book's main strength is its contextualisation and historicisation of migration and environmental change in the pacific islands. Given the multi-disciplinary nature of this book it will be of relevance to a wide audience of students and scholars of politics, geography, development studies, anthropology, law, psychology and public health. It will also be compelling reading for policy-makers, non-governmental organisations and activists who are seeking to understand the impact of climate change on people. 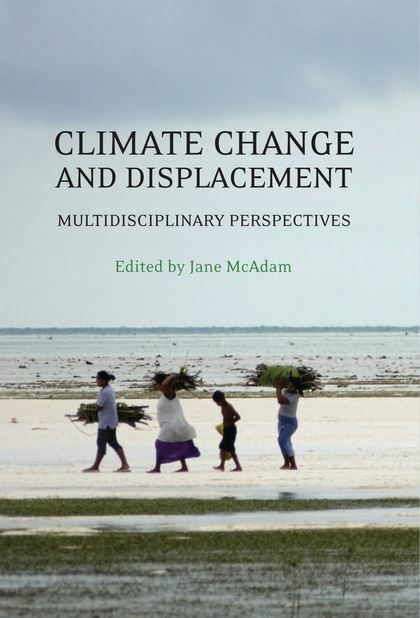 “McAdam's multidisciplinary collection of essays on climate change and displacement is a welcome addition to a corpus of literature largely dominated by studies on the scientific underpinnings of climate change and on proposed mitigation strategies. The chapters are concise, yet dense and engaging; the topics covered are wide-ranging and build upon one another to provide a fluid read; and finally, it provides a 'one-stop shop' for an overview of the important but still nascent subject of climate-induced displacement. “Climate Change and Displacement...brings together a wide assortment of disciplinary perspectives on climate-induced displacement...the splendid breadth of ethical, political, legal, economic and scientific perspectives offered is unusual for a law publication. Climate Change and Displacement generally succeeds because of the freshness and ambition of the contributors' approach, the clarity of their ideas, and their stimulation of informed thinking about this increasingly important subject. Although it is a relatively short book, at just 258 pages, it is dense it detail. It is also exceptionally well edited and referenced, and reads easily. As with many books in the Hart Publishing stable, this one should appeal to a wide array of readers, including seasoned scholars, students, policy-makers and others who are interested in the plight of people displaced by climate change.